A mock-up showing what new, colored iPhones might look like. The tech world is waiting expectantly for Apple to announce its latest batch of iPhones. The devices will likely be unveiled sometime in the second week of September (the company’s usual drop date), and rumors this year have been pretty consistent, pointing to the launch of three new devices. A new report from Bloomberg is the latest to follow this prediction. Bloomberg’s Mark Gurman and Debby Wu say that some inside Apple are labeling this another “S year” — meaning that the new phones will keep existing designs, but update the internals. As growth in the global mobile market slows, Apple will also be looking to raise average prices of its handsets. So, sorry, but the $1,000 smartphone isn’t going anywhere. Three new iPhones. Expect an upgraded iPhone X with a 5.8-inch OLED screen; a new high-end iPhone with a 6.5-inch OLED screen; and a new cheaper model (which will look like the iPhone X) with a 6.1-inch LCD screen. The two larger devices may have dual-SIM card slots in some regions. Cheap(ish) and colorful. 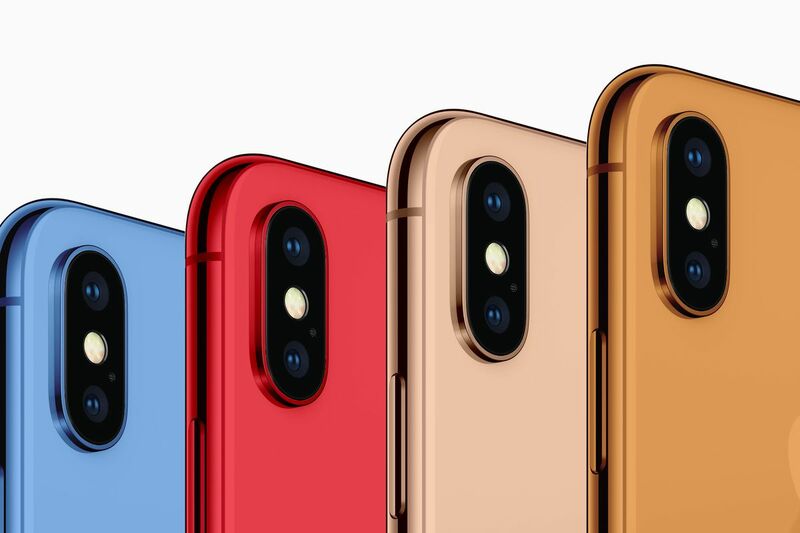 The 6.1-inch iPhone will come in a variety of colors. (Earlier rumors said gray, white, blue, red, and orange variants will be available.) It’ll also have un-colored aluminum edges instead of the color-matching stainless steel casing on the iPhone X. Gestures for all. All three devices will have the new gesture controls introduced in the iPhone X as well as Apple’s face-unlocking system Face ID. Apple is also expected to take advantage of the 6.5-inch device’s larger screen with the ability to “view content side-by-side” in apps like Mail and Calendar. Naming confusion. According to Bloomberg, there’s been quite a bit of internal discussion over the names, as the three devices aren’t easy to differentiate. The new high-end device might be “the iPhone Xs” with the larger device “the iPhone Xs Plus.” That’s subject to change. Peripherals and more. Sometime this year (not necessarily in September), we can also expect updated AirPods; a new Apple Watch with a larger screen in the same body; a new wireless charger (probably the much-delayed AirPower mat); and upgraded iPads Pros with slimmer bezels and Face ID replacing the fingerprint-sensing home button. As usual, this information is by no means definite, but it certainly fits what we’ve seen so far this year. Expect to hear more in September; invites to the actual event should arrive sometime soon.